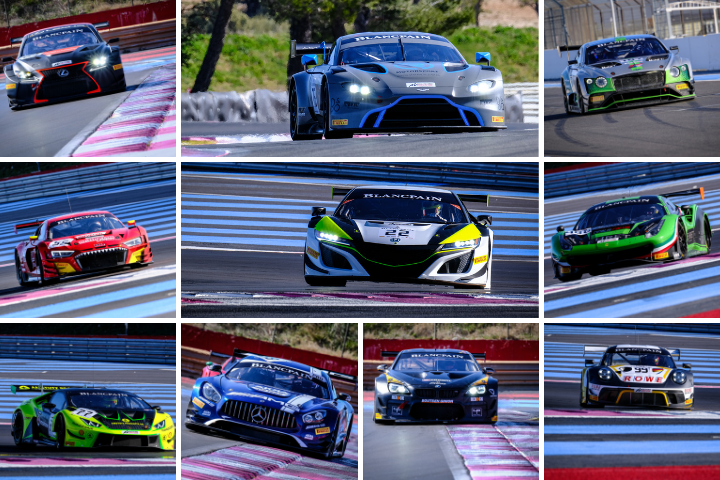 The 2019 Blancpain GT Series campaign is officially underway following two days of intensive pre-season testing at Circuit Paul Ricard. A total of 47 cars participated in the annual test, which was run over Wednesday and Thursday (13/14 March) at the French venue. The presence of more than 30 teams made for a bustling paddock atmosphere, with several new and returning outfits among those that made the journey. They were greeted on Tuesday morning by clear skies and sunshine, which prevailed for the majority of the test. The conditions allowed extensive running to take place as teams set to work on their development programmes, with some competitors logging more than 300 laps of the 5.8km track. Marco Bonanomi emerged as the ultimate pacesetter with a best effort of 1m52.765s in his Honda NSX GT3. Remarkably, the Italian set the time just as the chequered flag flew at the end of Thursday’s afternoon session. Bonanomi narrowly edged out the #88 AKKA ASP Team Mercedes-AMG GT3 of Raffaele Marciello, who began his defence of the overall Blancpain GT Series drivers’ title in strong fashion with a lap of 1m52.801s on Thursday morning. Next up was Maro Engel, whose best time of 1m52.856s was posted late on Wednesday afternoon. The German driver and his Black Falcon Mercedes-AMG squad will defend the Endurance Cup title this term and, like Marciello and AKKA, began that effort in style. Porsche machinery also ran well during the test. Dennis Olsen was the fourth and final driver to break the 1m53s barrier, placing the freshly liveried #99 ROWE Racing Porsche 911 GT3 R fourth on the overall order. The ROWE crew was among a number of outfits adapting to new machinery during the test. Elsewhere in the pit lane Jenson Team Rocket RJN began its working relationship with Honda in strong fashion, while Garage 59 was able to do the same as it acclimatised to the Aston Martin Vantage GT3. Panis-Barthez Competition debuted its Lexus RC F GT3, which will run in partnership with the Tech 1 Racing squad this term. The new Lamborghini Huracan GT3 EVO was put through its paces by several outfits, with Barwell Motorsport proving particularly busy by completing almost 600 laps between its two cars. The latest Audi was hard at work too as teams racked up significant mileage with the Ingolstadt marque’s R8 LMS EVO. Bentley (Continental GT3), BMW (M6 GT3) and Ferrari (488 GT3) were also represented, with each brand confirmed on the 2019 season entry list that was revealed on Wednesday afternoon. The Blancpain GT Series Endurance Cup will maintain the same high standard set in recent years, with a 49-car grid confirmed for the new campaign. What’s more, 24 full-season cars will tackle Blancpain GT World Challenge Europe in 2019. With the official test now complete, teams will switch their focus to the opening race of the season at Monza. Set to take place over the weekend of April 13/14, the Endurance Cup event will represent the first competitive action of the new campaign. With a packed grid of at least 49 cars set to tackle a three-hour race at the iconic Italian circuit, it promises to provide a spectacular contest.